This comprehensive exterior sign program announces the Penn brand at each of the major entrances to the University quad and helps define the campus boundary. 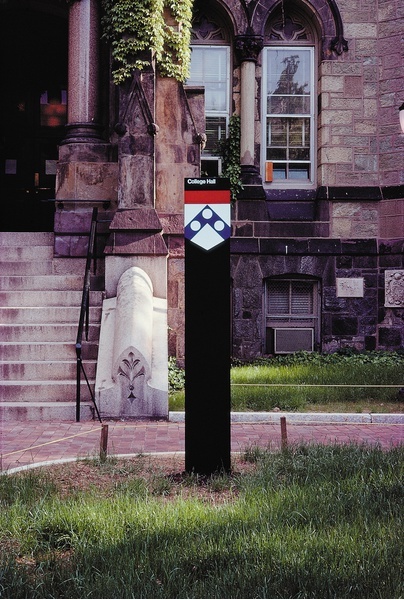 Free-standing and wall-mounted signs on campus identify buildings, classrooms and facilities. Heraldic symbols are coupled with contemporary lettering and detailing. This eclectic composition responds to divergent architecture styles which include buildings designed by such masters as Furness, Venturi and Kahn. The project has been cited as a university case study in numerous publications and at the Society of Environmental Graphic Designers Campus Planning Seminar.